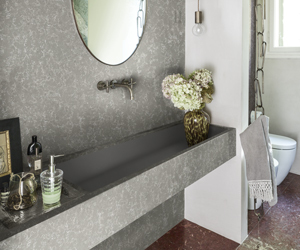 With proper care, the Corian® Quartz surfaces in your home will look new for years to come. To ease your mind, a Corian® Quartz surface is warranted for 10 years against fabrication and installation defects. Not only that, if you decide to sell your home, your warranty is transferable to the new owners. Our surface products are beautiful, built to last, and easy to maintain. Routine care and maintenance ensures lasting beauty, andhelps retain the surfaces’ original appearance. But it’s good to know that your Corian® Quartz surfaces also come with the protection of a 10-year transferable residential limited warranty, backed by a company with a sterling reputation, and a legacy of over 50 years in the surfaces business. For homeowners, your Corian® Quartz warranty protection starts at installation. Our retailers or installers will register your warranty for you, and make sure that your surface is covered by the Corian® Quartz limited warranty. Architects, builders, and designers will hardly be surprised to learn Corian® Quartz offers some of the most stringent warranties in surfacing. For warranty inquiries, please contact us or call 1-800-426-7426. For customer service inquiries, please call 1-800-426-7426.